Getting through town was slow going on this particular afternoon, Nov. 18. Stuck once again in slow-moving traffic on Albany’s main drag, I’m wondering if this is ever going to get any better. The answer is no, it won’t. Not in the foreseeable future anyway. Instead, we’re bound to get delayed more often just like drivers in far bigger towns. The problem, obviously, is that at certain times of the day there are more vehicles on the road than the highway system can handle without delays. Most of the time those delays are not that great. Maybe a minute or two, rarely more. But they seem like a nuisance when you’ve never before experienced them during almost 40 years of commuting and otherwise driving around the mid-valley. You’d think that projects would be in the works to allow traffic to flow with fewer delays. But what could be done? The Highway 20 couplet along Lyon and Ellsworth cannot be expanded without tearing down half of downtown. Realizing this, city officials considered planning for a new bridge that would have Highway 20 traffic bypass the city by routing it through Millersburg to I-5. But an insane state planning rule forbade even consideration of this long-range alternative because the potential site of the bridge was outside the city’s urban growth boundary. At the junction of Highways 99E and 20 (Pacific and Santiam) the state long ago built the only possible solution once a so-called flyover was ruled out as either too expensive or otherwise impractical. So we have two heavy streams of traffic crossing each other through a series of lights, which also have to account for turning movements and cross traffic on Geary. Things would be worse for Albany if forward-looking engineers in the highway department had not, in the 1930s, planned and built the overpass at the other junction of 20 and 99E, at Lyon Street and Ninth, and if the city, 60 years later under the leadership of Guy Mayes, had not expanded this junction to handle more cars. Thinking about all this the other day, I emailed Ron Irish, Albany’s transportation systems analyst. He responded that yes, congestion on the Albany highway system was increasing, owing partly to population growth and partly to the relatively low price of fuel. 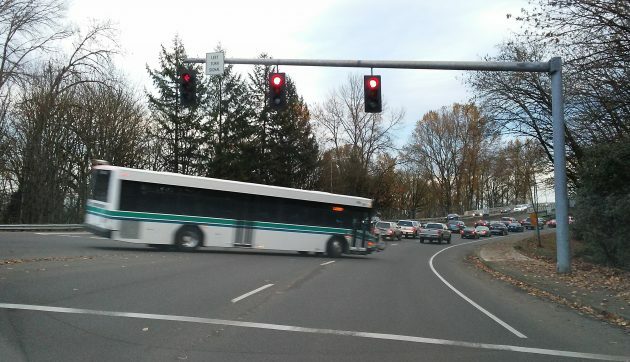 But he didn’t think that any of the major intersections in town had exceeded the performance standards set by ODOT, at least not yet, even though some were getting close. In the meantime, he says, Albany will keep trying to advance capacity projects already identified in the city’s plan and keep signals timed to “optimize performance.” (That latter item sometimes breaks down, especially when the old downtown signals get out of phase, with two showing green and one, inexplicably, stopping everybody with red.) Beyond that, the city encourages walking, cycling, and taking the bus. An Albany Transit System bus turns from Spring Hill toward the bridge into town. Congestion is a good thing if it ultimately gets people out of their single-occupant car trips. What we need is not “Level Of Service” (the 20th-Century traffic engineers’ fetish) but ACCESS to places we want to be. The car and its infrastructure have created a built environment that is not profitable for businesses or sustainable for taxing entities. I recommend a visit to Strongtowns.org, and an extensive tour of the blogs and links therein for an understanding of the challenges and opportunities facing Albany. And we haven’t even touched on autonomous cars! They are coming, you know, and soon. I agree, biking in Albany is scary. Hasso seems to get around though. I felt much safer on a bike when I lived in Corvallis. I know there was an article last October about the economic development department working to find a store for the old Ray’s locations. That would be a huge help. The population sure has grown out there since Ray’s closed. Would like to hear an update from the city on how that’s going. Let’s hope any future food store is not in the mold of the last one …an overpriced convenience store. You get what you’re willing to pay for. Simple as that. What we need is commuter rail between Albany and Corvallis like WES between Wilsonville and Beaverton. The tracks already go by the key location stops: Downtown Albany station, North Albany park-n-ride, HP campus, Downtown Corvallis, and OSU.